Bill Hewlett was one of the twentieth century’s most remarkable men, and one of America’s most uncommon. This quiet, self-effacing man, together with his longtime friend and partner, David Packard, changed the world and helped usher in the modern technological age. Their co-founding of the Hewlett-Packard Company in 1939 (Hewlett won the coin-toss to decide which name would come first and which second in naming the company) was Silicon Valley’s defining partnership. It was also the valley’s first major start-up company, and one of its most successful, ranking at Hewlett’s death as the nation’s thirteenth largest business, with annual sales of nearly $50 billion and some ninety thousand employees in 120 countries. William Redington Hewlett was born 20 May 1913 in Ann Arbor, Michigan, where his father, a respected physician, served on the faculty of the university’s medical school. The family’s subsequent move to California when Bill was three years old, occasioned by his father’s acceptance of a faculty position at Stanford University, introduced young Bill to the cultural, scientific, and literary world of a dynamic and growing San Francisco Bay Area, anchored on the East Bay by the University of California at Berkeley and on the West Bay by Stanford University, and centered in the vibrant, brash, and whimsical city of San Francisco, where the family lived. Although the father died suddenly when Bill was twelve, the family rallied. Bill was enrolled in San Francisco’s Lowell High School, and life moved on. His high school years were not academically noteworthy, doubtless influenced by the then little noticed and rarely accommodated dyslexia with which he dealt all of his life; but his intellectual curiosity, his incessant “tinkering” as he called it when he sought to understand how things worked, and his sterling character, won the admiration and respect of his high school principal, who encouraged Stanford to take a chance on Bill. Bill was admitted as a freshman in 1930. Hewlett was fortunate to have studied under and to have been mentored by Frederick Terman, one of Stanford’s most famous professors, who was to a great degree responsible for the subsequent development of Silicon Valley. Upon completing his engineering studies at Stanford in 1934, Hewlett studied at, and earned a master’s degree in engineering from, MIT, returning to Stanford in 1936 to continue his graduate studies in engineering. 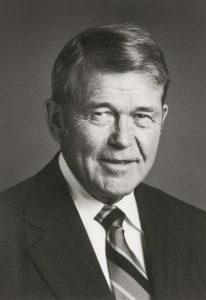 Hewlett and his fellow student and close friend David Packard, with Terman’s encouragement, formed the Hewlett-Packard Company in 1939 (its corporate offices and laboratories being located in Packard’s garage at home in Palo Alto). With the exception of four years during World War II when he served as an officer in the U.S. Army, Hewlett’s professional life was committed to the building of the company. He was indifferent to the trappings of wealth, but used his to help others and to make good things happen. The year 1939 was also of signal importance in Hewlett’s life as he and Flora Lamson, whom he had been courting, married. They had five children and together raised them to adulthood until her untimely death in 1977. Hewlett-Packard’s first commercially viable product, developed in Hewlett’s Stanford lab, was the audio oscillator. The Walt Disney Company purchased eight of the first ones for $71.50 each, for use in the 1940 film Fantasia. The product was also of use to medical doctors, hospitals and clinics, geologists, engineers, oil and mining companies, and the military, among others. This device launched Hewlett-Packard, whose products over the next sixty years captured the world’s admiration, and transformed the nature and character of technology, including its miniaturization in manufacturing, testing, measurements, copying, scanning, and calculating, and for the most sophisticated technological requirements of medicine, science, research, business, universities, and the military worldwide. Hewlett and Packard oversaw the company with enviable management, technological, and scientific skills. They also managed the company with a new set of operating principles and with an intensely personal style that came to redefine much of American corporate life and culture, e.g., profit-sharing, employee stock ownership, flexible work hours, and health insurance. What came to be known as the “HP way” marked the company as a special place and made it nearly as famous for this unique business culture as its products later became for the inventive, cutting-edge technology that they consistently represented in the marketplace. Hewlett regarded his employees as the foundation of Hewlett-Packard’s success and worked as comfortably with the most junior members of his engineering staff as he did with the most senior members of his management team. Hewlett never saw his employees as being mere interchangeable parts, nor as expendable; no, they were his partners, colleagues, and friends, and they counted. His fertile imagination and curiosity about how things worked, from childhood on, earned him the title of “true visionary” as he foresaw new answers to old and intractable problems and solutions to what had been unworkable answers. This he did in his notably quiet and unassuming way, and for all these reasons he is both remembered and respected by the tens of thousands of people whose lives he touched in the Hewlett-Packard Company for sixty-two years. Hewlett was honored for his work both here and abroad by governments, universities, scholarly and scientific societies, trade associations, and all the others whose admiration and respect were expressed almost continuously in recent decades. In 1985, President Ronald Reagan conferred on Hewlett the Presidential Medal of Science, the nation’s highest recognition for scientific accomplishment. Hewlett also served on several presidential commissions during his active years, participated in the affairs of the scholarly and scientific organizations to which he had been elected, and served on numerous boards and committees nationally and in his hometown of Palo Alto, California. In his personal life, he lived modestly for one of his position, preferring to raise his five children in Palo Alto, to center Hewlett-Packard’s corporate interests within the city, and to participate in its civic affairs and in the work of his beloved Stanford. He drove himself to work and occupied the same office (seemingly with the same furniture) for more than forty years, but, rather than work there, preferred to “walk around” the offices and labs to see what was happening and to engage, question, challenge, and encourage those who were doing the company’s work. It was he who asked the right questions and left the answering to others. He helped us grow by learning from our mistakes and from the encouragement and confidence we all experienced when things went right. I recall one conversation involving Bill, his son Walter, and me at his home following a review of our upcoming meeting of his foundation’s board. Bill could not shop for a Christmas present for his second wife, Rosemary, owing to an operation from which he was then recovering. He asked Walter to shop for the gift he wanted, a pair of binoculars for Rosie’s bird-watching. He gave Walter a hundred dollars for the purchase. Walter, who knew a great deal about binoculars and optics, suggested that his father might prefer one of the better German or Japanese binoculars that would cost not a hundred dollars but six to eight hundred dollars. All this after just settling on proposals to spend some $15 million of Bill’s money at our next board meeting. Many lives were touched by Hewlett through the remarkable scope and scale of his philanthropies. Stanford (his alma mater) and UC Berkeley (his late wife Flora’s alma mater) enjoyed his special attention. These interests extended around the world: to population issues and the status of women, their education, and economic opportunities in Africa, Southeast Asia, and Latin America; to conflict resolution, particularly in eastern and southern Europe, the former republics of the Soviet Union, and the Middle East; to U.S.-Latin American relationships; to the needs of the nation’s liberal arts colleges and research universities; to the environment in the western United States; and to the improvement of K-12 education, the performing arts, and the many communities and neighborhoods of the San Francisco Bay Area. He also had a vital interest in his adopted California, and in 1994 founded the Public Policy Institute of California, to be guided by the longtime president of his foundation, Roger Heyns, chancellor emeritus of the Berkeley campus of the University of California. The range of his philanthropy reflected his lifelong interests in other cultures and societies, in strengthening and improving the quality of life for disadvantaged people living in the Bay Area, in the health of the environment (he was an accomplished botanist and a lifelong climber, hiker, fisherman, hunter, and photographer of California’s high and coastal mountains, its wildlands, meadows, forests, rivers, and coastline and of much of the intermountain West as well), in the well-being and vibrancy of the communities and region in which he lived and in which Hewlett-Packard was located, and in music, which he deeply loved. These philanthropies were accomplished by his personal generosity from funds he set aside, and through the work of the William and Flora Hewlett Foundation, created in 1966 by Hewlett and his first wife. The foundation now ranks as one of the nation’s largest. “Never stifle a generous impulse” was one of his favorite and best-known phrases; as was his custom, he practiced what he taught. It was my honor to serve as president of his foundation from 1993 to 1999. Never once in those years did he ask me to make a grant or deny one, relying instead on the collective judgment of his independent trustees and the work of his professional staff within the foundation. And while he chaired the board for most of those years, I never once observed him seeking to impose his will or to otherwise stifle or limit discussion. To the contrary, it was he who asked the right questions and left the answering to others. He helped us grow by learning from our mistakes and from the encouragement and confidence we all experienced when things went right. Bill was not fond of looking backward. Instead, he looked steadily forward, beyond most people’s more limited perspectives or the natural limits of their imaginations, searching for the nuances and subtleties of the problems encountered, discovering how, by redefining a problem, the solution was made clearer or even self-evident, challenging when complacency became confused with contentedness, and asking, always asking, if there was not a better way or a more fundamental question to ask. He was a great teacher in this sense, as well as a colleague; and he seemed to derive as much pleasure from the one as from the other. In the end, his greatest gift to future generations was not the compass he could build with his hands, but his moral compass. Its cardinal points were knowledge, modesty, justice and hard work. His life was guided by what seem to me innate principles of rectitude. He never wavered at home or at work. He was true to himself and an example to us all. It is for this I am most grateful to him. What an example he was to us all; and so he shall remain. Note: This essay by David Pierpont Gardner was delivered on the occasion of Bill Hewlett’s memorial service. At the time, David was president of the William and Flora Hewlett Foundation and president emeritus, University of California and University of Utah. This is reprinted with permission from the Proceedings of the American Philosophical Society, vol. 147 , June 2003.